You can now set a rating for another person after you’ve completed a transaction with them using Gliph Marketplace. 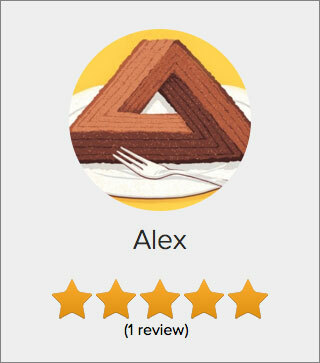 Ratings you’ve received from completing transactions on Gliph will now be recorded and displayed as an average on your Profile. Reputation ratings allow you to build up credibility for your account on Gliph. You can use them to help you make a decision as to whether you trust someone before completing a transaction with them. You must complete a transaction using a listing in Gliph Marketplace to be able to assign reputation. This means if a Bitcoin payment is involved, you must have a Coinbase or Blockchain.info wallet attached and use Deal Flow to make the payment. If you already completed a transaction in Gliph Marketplace, you should already have received an email allowing you to rate the other person or people you’ve interacted with. Transactions completed outside Gliph Marketplace will not offer a chance to set Reputation. 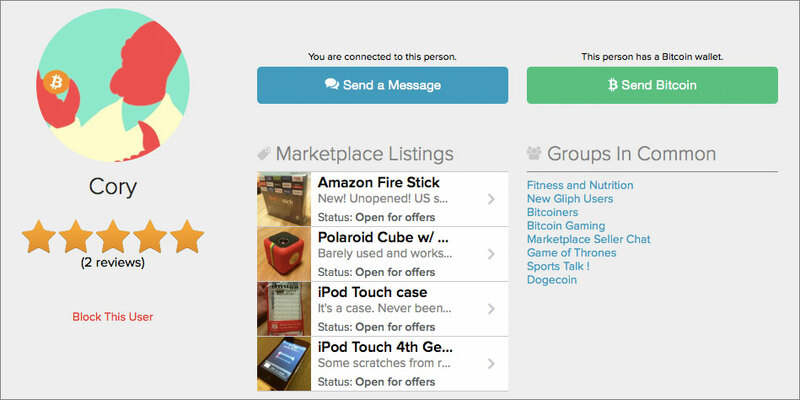 Gliph Profiles continue to become more useful, showing off information about another user’s Marketplace listings, Groups and Channels in common, whether they have a Bitcoin Wallet attached and now the reputation. This information is in addition to the personal data they’ve chosen to share publicly or privately with you. This is a screen capture of the current live view of Cory’s Gliph Profile. 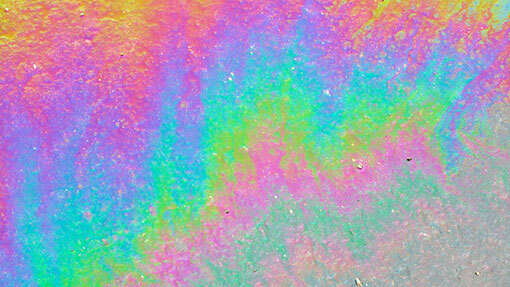 We’re excited to see Gliph identity coming into its own with so much useful information! We’ll be monitoring Gliph reputation to prevent abuse and we plan to increase the depth of information available over time. If you haven’t, get a move on with listing something for sale in Gliph Marketplace to begin establishing your reputation today! This entry was posted in Bitcoin, Consumer Security, Gliph Community, Gliph Marketplace, Profiles, User Experience on March 17, 2015 by rob. Have you ever felt the need to turn your phone upside down so people won’t read a message in a push notification? Today, in an update for iPhone and Android, we’re allowing you to choose which conversations you want to show up in push and which should stay locked up for viewing in the app. 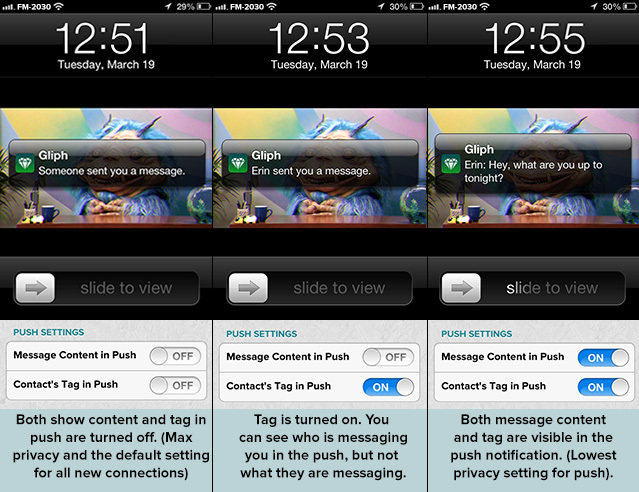 So far, Gliph has only allowed push notifications to say “Someone sent you a message.” With this update, you can now choose to show the tag of who is sending you a message, and if you want, the content of the message as well. 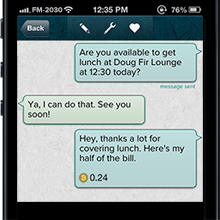 Unique to Gliph, you can make these changes on a per-contact basis, meaning for one contact in Gliph you can show message content or tag in the push notifications, and for another show nothing at all. This entry was posted in Consumer Security, Gliph Android App, Gliph iPhone App, Gliph Messaging, Privacy, User Experience on March 26, 2013 by rob. Today’s Dropbox is a small but shining invention of our Digital Revolution. Technology startups are now designed to grow, and done successfully can be enormously profitable. Great software is empowering people by giving them efficient control over their social lives, financial plans, travel needs and health care in ways never before possible. But the Digital Revolution is also introducing a new hazard with a wild and unpredictable impact: privacy violations. The first drop box was invented by Robert Kay in 1760. It increased the speed and efficiency of fabric weaving and helped usher in the Industrial Revolution. For seventy years, advances in mechanics, chemistry and urbanization resulted in both unprecedented improvements to living standards and the foundation of the modern capitalist economy. The swift change brought with it unintended consequences. Coal-burning factories choked citizens and darkened the sky with a mix of smoke and fog. In London, fatal outbreaks of Cholera resulted from draining raw sewage directly into the Thames. In Cleveland, oil refineries spilled crude into the Cuyahoga River causing it to catch fire three times in 1800s. This entry was posted in Consumer Security, Data Breaches, Privacy and tagged digital revolution, industrial revolution, pollution on February 26, 2013 by rob. We’re pleased to share that Gliph was included in a new report on Consumer Security by Forrester Research. The report was written by Security and Risk analyst, Heidi Shey (@heidishey) and is titled: 2012 Consumer Security Market Landscape: Key Dynamics and Growth Opportunities. The focus of the report is the changing dynamics of the consumer security market, including the proliferation of freeware and the “app internet.” In the United States, the consumer security market is dominated by Symantec, McAfee and AVG. This entry was posted in Consumer Security, Forrester Research, Privacy and tagged forrester, market trends, report, research on December 1, 2012 by rob.